If we had to put a crown on world’s most recognizable cheese, salty-sweet emmental would probably be our queen, with its golden hue and holey-er-than-thou holes. This gloriously melty Swiss-born cheese impressively never separates under heat. It’s nutty and fruity and loved all over the planet. Maybe we’re biased, but we think it’s especially amazing in the hands of Wisconsin Master Cheesemakers. 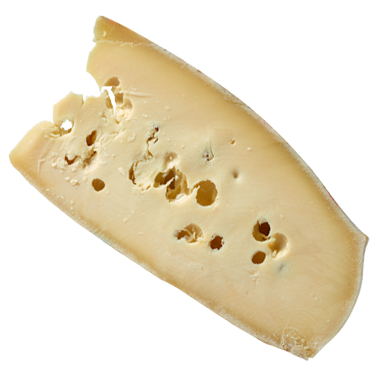 We can’t get enough of emmental’s roasty, toasty, nut flavor and melty goodness. Whenever we throw a fondue party, you can be sure that emmental is the first to get the invitation. Lucky for us, it always responds with a ja (or yes, if you don’t speak Swiss)! Swiss-born alpine cheeses all have a long shelf life, and because they are low-moisture we recommend storing them tightly wrapped in plastic wrap or plastic bags. But don’t leave this one out too long since it can get slightly crispy at the edges. Substantial reds, light fruity whites and old world beers are great with emmental. For wines, we suggest zinfandel, syrah, merlot, riesling, grüner veltliner and sauvignon blanc. For beers, bock, stout, porter and weiss beer. In our opinion, fondue without emmental is simply melted cheese. It’s so nutty, fruity, creamy and melty. We love to pair Wisconsin emmental with Wisconsin potatoes whether melted over or into gratins, hash browns or home fries. Throw slices of it onto a reuben with some slivered onions. Send your thank you notes to Wisconsin.